Jon Nelson has been a journalist for more than 20 years in television, radio, print, and new media and has covered everything from Olympiads to political conventions. He has won multiple awards for his work. For the last 13 years, he has been part of the high school programming at Georgia Public Broadcasting. Most Bulldogs fans can sing "Glory, Glory" and know who Uga is. On game days, fans are serenaded at Sanford Stadium by the Georgia Redcoat Marching Band and know the history of the Hedges and the iconic Georgia G. Names like Fran Tarkenton, Herschel Walker, and Eric Zeier are just as familiar as Vince Dooley, Wally Butts, and Mark Richt. But even the most die-hard fans don't know everything they should about their beloved Bulldogs. How many times was Herschel Walker on the cover of Sports Illustrated? Who is strictly prohibited from walking under the Arch facing Broad Street? What body of water is underneath Sanford Stadium and what's it called? Who were "The Five Commitments" and what did they signify? 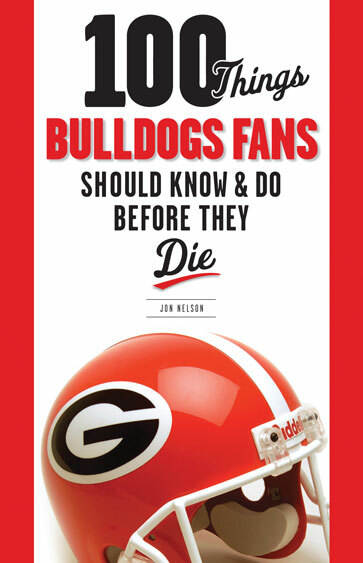 Whether you're a die-hard booster from the days of Vince Dooley or a supporter of current long-time head coach Mark Richt, this book contains all the things Georgia fans should actually see and do before they join that Bulldog Club in the sky. If you bleed red and black, then 100 Things Bulldogs Fans is for you. It offers the chance to be certain you are knowledgeable about the most important facts about the team, the traditions, and what being a Georgia fan is all about. Jon Nelson has been a journalist for more than 20 years in television, radio, print, and most recently, new media. He graduated from Florida State University with a degree in political science and minored in communications. For the last 13 years, while based in Atlanta, he has been part of the high school programming at Georgia Public Broadcasting. He has covered everything from Olympiads to political conventions and has won multiple awards for his work in a field he loves very much.